Tucker comes to us as an AI (artificial insemination) sire from Roy and Kim Schumacher and has full health clearances. Tucker is prcd-PRA, PRA-1, PRA-2, and Ichthyosis CLEAR. What an exciting opportunity to add Tucker to our breeding lines here at Snitker Goldens. We're so thankful for the kindness Roy and Kim have extended to us in allowing him to be an AI sire. 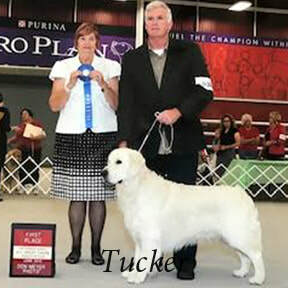 Tucker is a National Champion, International Champion, Honors Champion in Bronze, Silver, and Gold, World Beauty Champion, and World Beauty Champion in Bronze​. 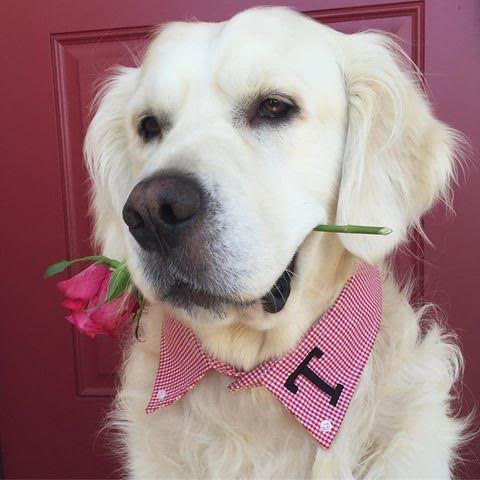 Tucker is also a famous golden on Instagram @tuckerandanniewhitegoldens! He has had several viral videos featuring himself with his puppies. He plays very gently with them and adores children and his humans. Tucker won several awards in the Dog Show circuit and several of his puppies have been in some major television commercials and television shows. Most recently, Tucker was featured in a children’s book. Below is a photo of Tucker promoting "The Chuck Book: An Interactive ABC Book for Everyone". Thank you to Roy and Kim for giving us this incredible opportunity to have Tucker be a part of what we are doing here at Snitker Goldens. Click to view Tucker's Pedigree and Health Clearances. Tucker promoting ​"The Chuck Book"
All photos used with permission and ©Roy & Kim Schumacher, Britta Lindhardt Nielson.